BUFFALO, N.Y. -- The Bisons put together a rally in the seventh, but the comeback ultimately fell short as the Bisons were bested by the IronPigs Friday night, 8-3, from Coca-Cola Field. Buffalo was held hitless but got on base twice on free passes in the first four innings. Anthony Alford recorded the team's first hit on a one-out triple in the fifth. He was left stranded at third base. The Bisons trailed by five runs in the seventh but summoned some two-out magic. 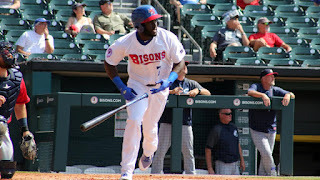 Alford roped his second consecutive extra-base hit with a double to put the Bisons on the board for the first time in the game. Rowdy Tellez crossed home on the hit. Then, Reese McGuire traded places with Alford after he slashed a double the opposite way. McGuire's hit cut the deficit to three runs. Buffalo nearly tied the game in the eighth. Danny Jansen was down in the count with two outs in the inning against IronPIgs' reliever Mark Leiter Jr. and struck a high and deep fly ball to left field. However, the ball tailed just left of the foul pole. Jansen ended up drawing a walk to load the bases, but the Bisons were unable to score in the frame. The Bisons scored a run in the ninth, but the rally fell short after the Herd couldn't overcome the IronPigs' six-run lead heading into the inning. Lehigh Valley jumped ahead to a 1-0 lead in the second on an RBI-double down the third base line from Damek Tomscha. Bisons' starter Chris Rowley helped himself out of further trouble by initiating a 1-2-3 double play with the bases loaded to exit the inning. Matt McBride's double threatened to bring home a run, but a strong relay from Alford in left field to Richard Urena at shortstop and eventually to Jansen at home plate cut down Joey Menesestrying to score all the way from first base in the third. The play ended the inning. Trevor Plouffe plated two runs for the IronPigs in the fifth on a long two RBI-single. In the seventh, Joey Meneses' single added one run to the lead. Then, Matt McBride hit a ground ball for a single and Trevor Plouffe scored from second on a throwing error. This gave Lehigh Valley a 5-0 advantage. Bisons' reliever Rhiner Cruz got into a one-out, bases-loaded jam in the eighth, but worked his way out of it by catching Collin Cowgill looking and getting Plouffe to line out to Jason Leblebijian at third.